Way back in 1994 my husband and I brought a small block of land. 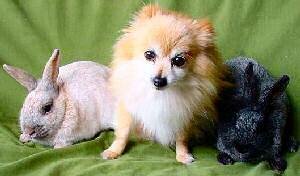 Our interests were anything that resembled a rare or endangered domestic animal. We were drawn to the annual Rare Breed Auction and displays at Willowbank Wildlife Reserve here in Christchurch. One of our visits to the Rare Breeds Auction was only to look, but we ended up coming home with some stock, starting with Shropshire sheep – they weren't just any old sheep – they were rare. The next additions were five Belted Galloway cows, they were shipped down from the North Island near Taupo – this breed was also rare in New Zealand. To add to our collection of animals we needed some chickens, so we purchased Araucanas which lay a blue-green egg. On occasions the Rare Breeds Society would have visits to different members' farms, and we would look at how others had managed to keep these Rare Breeds and make a small income off them. Having seen the Enderby Island Rabbit on one of these visits and hearing the stories about these unusual looking bunnies, my husband (who was not a bunny person at that time) made a passing comment that we would be interested in becoming caregivers for some. This was to be our next interest – the Enderby Island Rabbit. We had joined up with the Rare Breeds Society by now, and had been members for a short time. 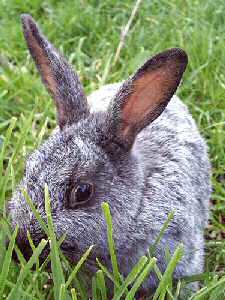 Add rabbits to the animals on your property. Natures Pace is looking for a rare breed of breeder who can help the Enderby Island Rabbits increase their chance of survival. All enquiries and orders are welcome. 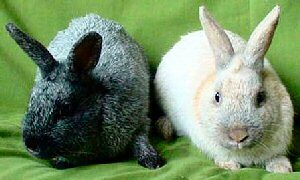 We were given three silver grey does, Daphne, Daisy, and Dahlia, and our next venture was to get these bunnies pregnant, as we were only the caregivers and we had no background in breeding or raising rabbits, we went back to the Society and got their advice on what to do next. We borrowed a buck from Willowbank and followed all the instructions, but nothing happened, and it seemed like forever before we had any results. All three does were sisters and lived in a custom built chicken coop made by my husband, we had wire on the bottom of the run and you had access to the back. Natures Pace Website – photos, information, etc.